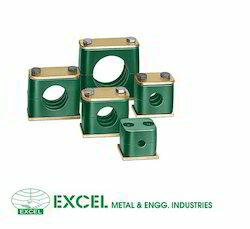 Size Range: 1/2''-10", 1/2"-8'', 1/2"-2", 1/2"-4", 1/2"-6"
We are the leading entity of a wide range of Hydraulic Cage Clamp. Our organization is well known in the industry for catering a distinguished segment of Hydraulic PVC Clamps. These products are manufactured using high quality components. 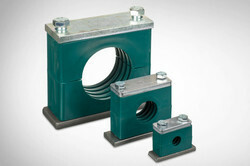 Hi-line pipe clamps are available in light, standard and heavy duty. Pipe clamps are made of polypropylene and M.S. top and bottom plates with C.S. hardened bolts. We also make aluminum pipe clamps as per requirement. Finally you can secure your pipe with our high-grade pipe clamp assemblies. Aluminium Hydraulic Pipe Clamp 1/2" - 16"
We are the manufacturers for Aluminum Pipe Clamp Heavy Series ranging from 1/2" to 16". We also manufacture stack type clamps also. Please enquire for rates.